Social Media Marketing: 3 Tips for Using Memes | 321Launch! Are you using memes to promote your business? This post shares social media marketing tips for using memes. By now you’ve seen photos of cats wanting cheeseburgers all over the internet, but do you know how to use a meme to your business’ advantage? Your company can benefit from creating shareable content to spread messages through this avenue. A meme is an idea, thought, topic or joke overlaid on an image that all (or most) members of a culture understand. 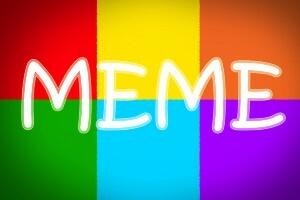 They widely represent a variety of common topics so a meme’s audience is aware of its meaning. Using this tool is a great way to reach a large group and spread your message because they are likely to be shared, clicked on and engaged with on social media. Here are three tips for using memes for your business. Memes have a wide internet reach because they are relatable to many sectors of the population, especially young people. When a meme uses humor, plays on a current event or trend and gets people talking, it can spread your name like wildfire. Taking advantage of shareable images can make a big difference in your social media marketing campaigns. Using a meme generator is a quick and easy way to create a humorous, informative or satirical image that your audience is sure to love. Before sharing, make sure you search the meme to know its history (you don’t want to spread content you aren’t fully versed with), have followed all applicable copyright laws and are sharing images that will resonate with your target audience. Part of why social media marketing is successful is because it makes your followers, fans and customers feel included in your business. Engaging on social media is a good way to start conversations, but you can also use memes to source your fans’ creativity. Hold a contest where followers create your next meme if you want to get them involved. Making relatable content, knowing the history of the image and including your followers are steps to using social channels to promote your business. How are you going to use memes in your social media marketing?